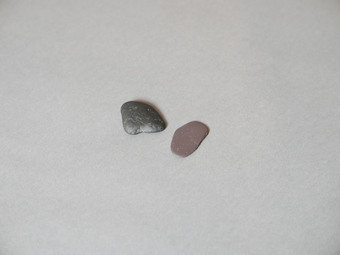 I collected these two stones from Crosby beach today. As a way to manage my hoarding habit (which is a ‘comfort thing’ and potentially dangerous) when I collect objects, I try to ‘build’ from them – to make the best of my collecting. I try to give the objects more attention because there is a reason I collect them, and a reason they exist. It makes me notice existence. I have chosen this artwork because it depicts a factory life that I feel connected to. Stoke-on-Trent, where I am from and live, has a large manufacturing heritage that is lost to generations like mine, or partially lost, and so to see the factory in this artwork is touching and powerful. The work makes us question the objects of our everyday world - where they come from and what journeys they have had before reaching us.